Schein So-Dress Slim Dress Orthotic 3/4-length insoles offer supreme foot comfort and more with a synthetic leather top-coat that softens and conforms over time and are ideal for casual and dress shoes. They help to relieve pain but more importantly, stabilize and supports your foot to prevent foot pain related to over-pronation and other disorders such as mild to moderate over-pronation, plantar fasciitis, heel pain foot arch, heel pain, ankle and knee pain, bunions, calluses, claw toes, hammertoes, metatarsalgia, and neuromas. 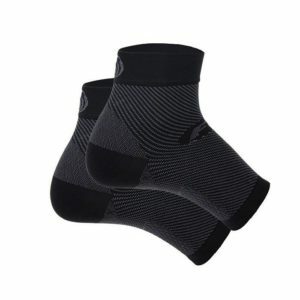 OrthoSleeve Plantar Fasciitis Foot Sleeve Black features award-winning Compression Zone Technology that helps reduce foot pain, heel pain, and arch pain.